Hi, My name is Basil and in this picture I am 2 months old. My birthday is August 2, 2003. 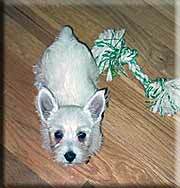 I came from a breeder along with my sis Rosie. I have two wonderful "parents" who I love to pieces and who love me even more. I am one lucky dude because I get whatever I want ... all I have to do is flash those puppy eyes. Hey there ... I came to my parents from a breeder. I am two weeks older than my bro and run the house (just ask anyone). My birthday is July 16, 2003 and I am not even one year old yet. I heard it is coming soon though ... I can hardly wait. 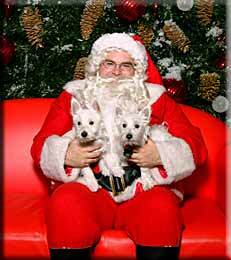 For our first Christmas we got to go to the mall and have our picture taken with Santa Claus. There were tons of other pups there and we got play and play and play. We were even allowed to run up and down the mall with Dad. It was great fun. I am now 8 months old and I weigh about 12 pounds. Not sure how big I am going to get but can't wait to find out. Basil: Well, it has been an eventful couple months for me. We found out that I have Legge Perthes disease in both legs and I am now recovering from the second surgery. Mom feels sorry for me so I get lots of attention and treats. Soon, I will be starting basic obedience. Hopefully, I can outshine my sister.